The 150th anniversary of Iowa State University is just around the corner, and to celebrate, Special Collections and University Archives are putting together a brand new exhibit. Titled “We Are ISU: Snapshots of Student Life”, the exhibit will focus on photographs, scrapbooks, journals, t-shirts, and more from past students. There are several collections included within this exhibit, so if you see something that interests you, you can ask the staff in the Special Collections reading room to see other boxes from that collection number to discover what other cool pieces of ISU history may be in there. Conservation technician Jim Wilcox working on photo mounts for the exhibit. Collections conservator Sonya Barron working on attaching tissue hinges to a photo. The staff at the preservation lab has been busy getting the exhibit ready for opening day. Boxes from different collections line the book trucks in the lab, waiting to be put on display. A few of the objects have needed minor repair work, like mending tears, removing tape, surface cleaning and attaching hinges for display. This is all done to make sure that the exhibited items are stable enough to be put on display or to be digitized. Each item has been mounted on a custom-fit display stand made from museum-quality mat board. The artifacts will then be installed into the glass exhibit cases in the SCUA Reading Room. One of the many book trucks in the preservation lab holding mounted photos for the exhibit. Can you imagine not being able to leave Ames to go shopping without approval from the residence director!? While talking with Jim, I learned some interesting facts about Iowa State University history that I had no idea about. For example, in 1929 Fan Chi Kung, an international student from China, died in a rollover car accident while teaching a fellow student how to drive. Because his family was not able to afford to ship his body back home, he was buried in the University Cemetery. Special Collections holds his photo albums from his time here on campus. This photo is from Fan Chi Kung’s photo album, and has the caption “In my room” on the back. According to an information card, many Chinese students rented rooms from a home on Welch Avenue, but it is not clear whether Fan Chi Kung had rented this room there as well. The exhibit captures numerous snapshots of student life from the last 150 years, so you never know what cool things you might discover as you go through the exhibit. Special Collections and University Archives Reading room while the former exhibit, the Farmers’ Protest, is removed and the new exhibit, We Are ISU, is installed. Where: Memorial Union, the Sun Room. To check out the exhibit, visit the reading room from 9:00 am to 5:00 pm Monday-Friday! Over the last few months, our preservation lab has had some new faces working alongside the full time staff. Earlier this summer, the Iowa State University Library decided to begin a relationship with the Project SEARCH program. Project SEARCH is a worldwide program that creates work experiences and training for individuals with intellectual and developmental disabilities. The project began in 1996 at the Cincinnati Children’s Hospital, and has been continuing ever since. Participants work in a nine-month unpaid internship where they will learn job skills from three different jobs. The positions are in a real work environment, so that participants can learn how to gain and maintain paying long-term employment in their community. Project SEARCH first came to Iowa in 2011, and since then has been introduced to fourteen locations across the state. Current Project SEARCH intern Shyanne working on surface cleaning documents in the preservation lab. While working in the preservation lab, participants have worked closely with Lennox Foundation Intern Cynthia Kapteyn and Conservation Treatment Assistant Mindy Moeller on a number of different tasks throughout the lab. The participants have removed staples from documents, cut folders, worked on book prep by cutting book cloth and linen, cleaned documents, and sorted supplies. So far, the lab has had two interns this year. Each participant is different, so the tasks are adjusted to each person’s skill level. The hands on experience, mentor program, and weekly evaluations help the participants develop skills they may need in future employment opportunities. After finishing their rotation in the preservation lab, they are moved to another area in the library to start their next rotation. Multiple departments in the library are participating in the program, allowing for participants to gain skills from several different types of jobs, from preservation to office work. While this is the first time the university library has been involved with the program, other locations on campus have worked with Project SEARCH before. For more information on Project SEARCH, check out their website! 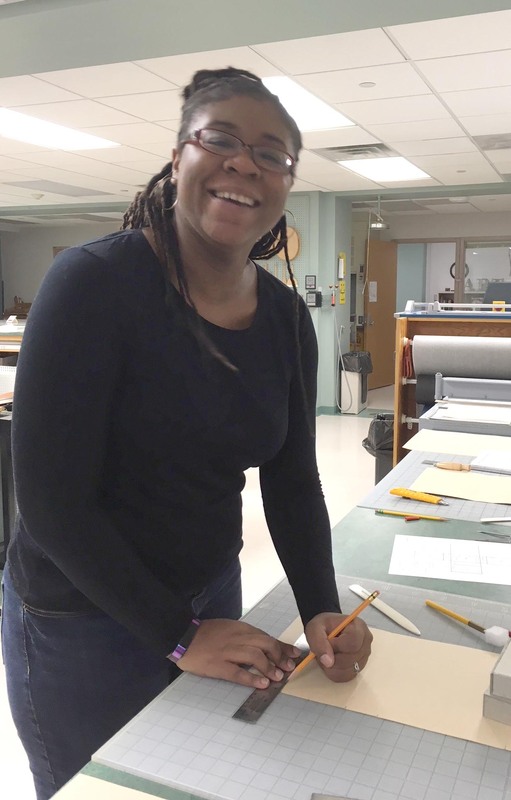 Recently, our Lennox Foundation Intern Cynthia Kapteyn finished working with conservator Sonya Barron to create a portfolio for a Periodic Table found here on campus. Dr. Wolfgang Kliemann, a member of the Mathematics Department at ISU, requested that the Periodic Table be repaired and preserved so that he could use it in lectures and demonstrations. The Periodic Table was made by W. M. Welch Manufacturing Company in 1956. The print was found rolled up and stuck deep in a closet in the Ames Lab facility. It had been stored there for many years after being removed from its hanging place on the wall of Gillman Hall’s main lecture auditorium. The heavy weight paper of the print had turned brittle. The print had sustained moisture damage at some point in it’s lifetime and had a few major tears. When measured, it turned out to be H 41 ¼ in x W 57 ¾ inches. Sonya and Cynthia knew that whatever they created to house the table, it was going to have to be large. Lennox Foundation Intern Cynthia Katepyn, ISU conservator Sonya Barron, and Dr. Wolfgang Kliemann with the Periodic Table. With Sonya’s input, Cynthia got to work building a portfolio that would not only house the Periodic Table, but would also work as a display support when Dr. Kliemann was using it during show-and-tells. The table was humidified and flattened and the tears were mended with a heavy-weight Japanese tissue and wheat starch paste. Once the piece was repaired, hinges were adhered with paste to the reverse side. These Japanese paper hinges were used to attach the Periodic Table to the portfolio that Cynthia had created. The portfolio needed to be light enough to carry with ease but still sturdy enough to protect the Periodic Table from future damage. Archival foam core boards, book cloth and cloth sewingse tape were used to create a portfolio that would open and close safely for storage and display. Once the frame was constructed, lightweight handles and dust flaps were added. With the handles, the portfolio could be carried from location to location without the worry of needing extra help to move the large piece. After all the work was completed, Sonya and Cynthia delivered the periodic table to Dr. Kliemann, who now has it in his office in Catt Hall. The hinge of the portfolio. Velcro was added to help keep the dust flaps closed. While working on this blog piece, Sonya thought it might be fun to include some photos of Gilman Hall during the era, during which the periodic table would have been in use! Cynthia found the photo below, and while we thought that we hit the jackpot and found a picture of the actual periodic table, we later realized that there is a slight difference between the lower right hand corners of the tables. However, they are very similar and it is still definitely a cool find! Back in March of 2018, our department conservator Sonya wrote a blog piece about the slides and papers in the Hortense Butler Heywood Collection here at ISU. The collection was digitized, and is now online for public viewing. One viewer, Kelli Ireland, stumbled across our piece and the collection while researching her barn in an effort to get it listed on the National Register of Historic Places. Kelli reached out to Sonya to let her know that Heywood’s name is quite literally written on her barn! Hortense Butler Heywood was a well known entomologist who was born and raised right here in Iowa. She co-authored the book, Handbook of the Dragonflies of North America and is also known for her detailed illustrations of specimens. Ireland’s family rented the property from Hortense’s daughter Julia for a number of years before purchasing the land. How cool for this family to have such an interesting piece of history in their own yard! Thank you to Kelli for sharing this wonderful information with us, and for allowing us to update our readers! The Butler Heywood Barn photograph by Kelli Ireland, Clay County, Iowa. In mid-June the Preservation lab hosted our Residency Librarian, Shaina Destine, for a full week of hands-on activities. This was the last week of Shaina’s residency at ISU Library. Shaina’s area of focus is in special collections and archives and she has done some great work with the library’s rare and unique collections. Shaina really enjoyed the opportunity to learn how to made and modify archival enclosures, a skill that she is sure she will make use for in her career. She also found it valuable to be able to assess the condition of special collections items alongside the conservator, as items were routed to the lab for treatment. Although Shaina had no previous experience with hands-on preservation work, she had done a lot of sewing as a child, helping her grandmother measure and cut. Those “measure twice, cut once” skills really came in handy during her week in the Preservation lab! Shaina had a wonderful, enthusiastic can-do attitude about all of her projects. The rotation was a positive and rewarding learning experience for both Shaina and for myself. We wish Shaina success and happiness at her next destination – the University of Tennessee in Knoxville! Some days you are handed a project that is so interesting and fun to look at yet poses to be complicated in how you want to accomplish the end result and this is one of those with the Curtiss-Wright Cadet Model Airplane as it needed an enclosure where the mounted airplane could easily slide out of its box with a drop down front and could be used in a display without its box. This was a big enough project that I used the floor in the Preservation Lab to get enough “flat surface space” for the book cloth cut all in one piece for the bottom part of the box. With the assistance of BB-stuff Baby Cys as weights they helped in several ways during the process of constructing this box from holding down a mylar template, gluing of book cloth, and Plazacoate blocks. I used Velcro dots to close up the front of the box where the drop down side is in place. The bottom tray inside of the box pulls out easily using two tabs and can be removed from the box completely for display. Blocks were used to stabilize the airplane in a level position even though the tail and wings had been previously bent. Underneath the airplane had an interesting marking and throughout all these years still had an antenna. This was a fun and satisfying project to work on and I was happy with the end result. The Curtiss-Wright Cadet Model Airplane is located in the Special Collections and University Archives of the Parks Library at Iowa State University. Find out more about the Curtiss-Wright Engineering Cadettes Program through our Special Collections finding aid.